We are proud of the quality of boxes we provide. All of our boxes come with a ‘Double Wall Guarantee’. The double wall moving boxes we supply are designed to be crush resistant, stackable and suitable for long term storage. Double wall moving boxes are carefully designed to offer more strength qualities, thus giving you more piece of mind. What are double wall moving boxes? Double wall moving boxes are made using a double wall board. Double wall board comprises of two outer liners, two layers of fluting and an inner liner. The most commonly used fluting in our double wall removal & storage boxes is a B C flute, which is a good and a medium cushioning flute used together. These double wall moving boxes are designed for packing heavier items and they offer much more strength and rigidity than a single wall moving box. What can I pack into these double wall moving boxes? The selection of double wall removal boxes supplied in our kits are varying sizes and are suitable for a wide range of household items. Our large box could be used for anything from linen to toys, ornaments and other bulky items. Our medium and small boxes could be used for packing heavier items such as books or kitchen equipment. 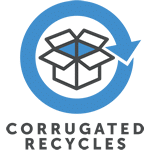 All of our removal & storage boxes are made from 80% recycled material and are fully recyclable. Moving Boxes Direct are committed to all environmental legislation.